At first sight, you’ll probably think these burn patients are slowly transforming into Aquaman. In the city of Fortaleza in Brazil, doctors are using strips of sterilized tilapia as a bandage for second- and third-degree-burns. The pioneering new treatment arose because the country lacked human skin, pig skin as well as artificial alternatives that will ease the pain of burn patients. 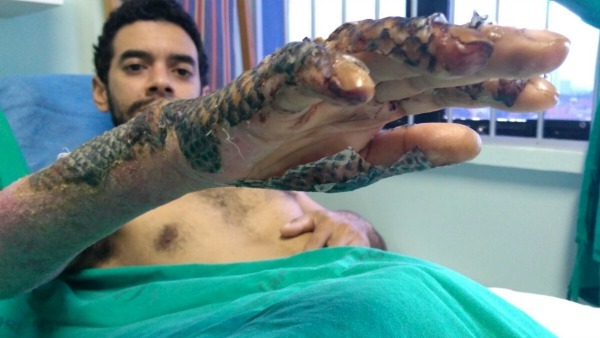 Because of lack of resources, burn patients in Brazil are treated with silver sulfadiazine cream. Although this method prevents the burns from being infected, it doesn’t necessarily facilitate healing. Moreover, the process of changing the gauze-and-cream dressing causes severe pain to patients. For these reasons, doctors explored the possibility of using the skin of tilapia, a popular fish widely farmed in Brazil. “Another factor we discovered is that the amount of tension, of resistance in tilapia skin is much greater than in human skin. Also the amount of moisture,” he added. Doctors treat patients with superficial second-degree burns by applying the tilapia skin and leaving it until patients scar naturally. Meanwhile, tilapia bandages are also used among patients with deep second-degree burns. However, these must be replaced a few times over several weeks of treatment but still far less frequent than the gauze with cream. According to Maciel, tilapia treatment reduces healing time by up to several days and cuts down use of pain medication. Prior to its use, tilapia skin were sterilized and sent for radiation to kill viruses before packaging and refrigerating. If cleaned and treated properly, these can last for up to two years.